This is a joyful musical that refuses to have a deeper moral or meaning, and that’s just fine. “Mamma Mia: Here We Go Again!” opens this weekend in theaters around the U.S. It is the sequel to “Mamma Mia!” which premiered ten years ago this weekend in 2008. Where the original film was a sometimes too-faithful adaptation of the 1999 hit Broadway musical of the same name, the new installment is an original work, playing off the story of the first film while inserting some new and extra ridiculous plot points. The result is shameless, joyous escapism arriving at a time when our society genuinely needs it. Unlike the original, no one in the cast seems embarrassed to be in a silly, fluffy musical. This is a movie that refuses to have a deeper moral or meaning, and that’s just fine. Movies have always been about escapism. But Hollywood in the current era seems to have move away from this principle. Even the candy-colored superhero films of the Marvel Universe always appear to be reaching for a deeper meaning; “Iron Man” is a story about war profiteering based in the lessons of the Iraq and Afghan wars, “The Avengers” was a 9/11 parable. Nuts to that, says “Mamma Mia.” This is a movie that is primarily about one woman’s attempt to throw a party at the resort she inherited. This is partly the fault of film critics, who live for hidden pathos. It’s not good enough to like a film because it’s fun and the good guys win; a moral lesson should be part of the story, or it’s somehow not really respectable or worthy of our time and attention. 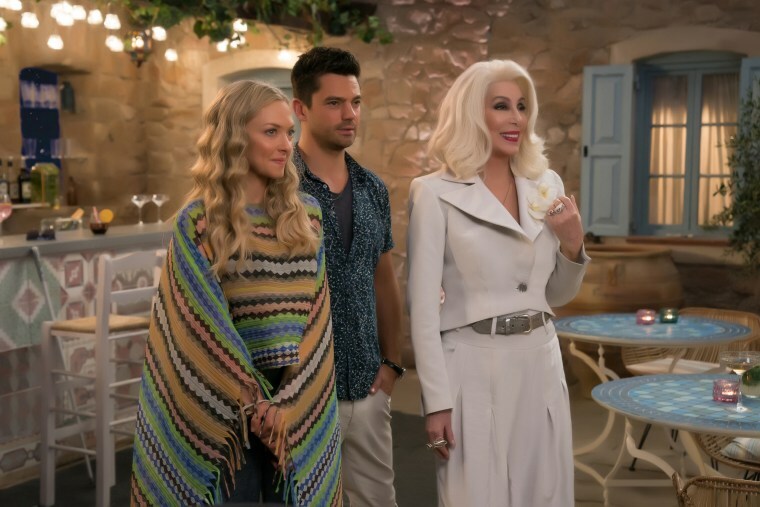 Nuts to that, says “Mamma Mia.” This is a movie that is primarily about one woman’s attempt to throw a party at the resort she inherited in the face of a challenging and perplexingly surprising thunderstorm. The original “Mamma Mia” had a bit more plot to it, but not much. The film, like the Broadway show, is what is known as a jukebox musical — filled with already existing songs that have been shoehorned into a plot. The story is merely an excuse to string the songs together. In the original, bride-to-be Sophie (Amanda Seyfried) invites the three men she believes could be her father to her nuptials, unbeknownst to her single and free-spirited mother Donna (Meryl Streep). The new film course corrects on all of this. Streep’s character is dead, and her generation is mostly kept to the sidelines, with the exception of a cameo or two. (Pierce Brosnan, who was the worst of the singers from the first film, is allowed exactly one verse sung half to himself. Colin Firth and Stellan Skarsgård only sing in group numbers.) Instead, the film cleverly recasts most of the original cast in a running set of flashbacks depicting the events that lead to Donna getting pregnant. The best of the cast is Lily James of “Downton Abbey” and “Cinderella” fame, who plays Young Donna. She, like Seyfried, throws herself into the musical numbers with abandon, giving Donna a genuinely carefree spirit that Streep only flirted with. The three young men were chosen for both their abilities to believably play the bigger stars they are replacing and their ability to sing, and all three do so with gusto. But for my money, the winner of this derby by miles is Hugh Skinner as Young Colin Firth. He somehow manages to pull off a fantastically ridiculous version of “Waterloo” while never forgetting to also exude Firth-iness while doing it. It’s positively delightful. “Positively delightful” is perhaps not coincidentally all the film attempts to be. It has a cast shamelessly going for it. “Positively delightful” is perhaps not coincidentally all the film attempts to be. It has a cast shamelessly going for it, and since all of the biggest ABBA hits were used up in the first film, they’ve been given as source material mostly deep cuts from the back catalog. This makes the musical feel almost original, since only the most dedicated of ABBA fans will know them all. Half the time the songs don’t even make sense, but that doesn’t matter, because the cast is having a ball up there and so are you. In 2008, a fluffy, silly and deliberately pointless piece of escapism might have seemed a little embarrassing to all involved (and all who reviewed it.) But clearly, it’s something the public hungered for, as the box office wound up pulling in close to $140 million. A decade on, with a political climate that is depressing when it’s not downright terrifying, this sort of complete escapism is just what the doctor ordered, and everyone involved knows just how important it is. As the trailer proclaims: Here we go again! My advice? Don’t try to resist it.